Diagnostic reproducibility of lobular vs. ductal lesions, based on histology alone, is less than optimal. The proper distinction between atypical lobular hyperplasia, lobular carcinoma in situ and low-grade ductal carcinoma in situ is critical for patient management. 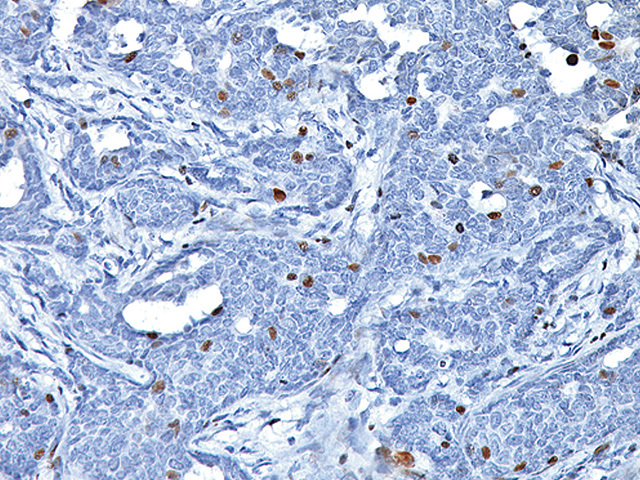 Studies have shown E-cadherin, a negative membrane marker for lobular neoplasia, is useful in the distinction of ductal neoplasia vs. lobular; however as a negative marker for lobular carcinoma, it can be difficult to interpret, particularly in challenging cases (2). 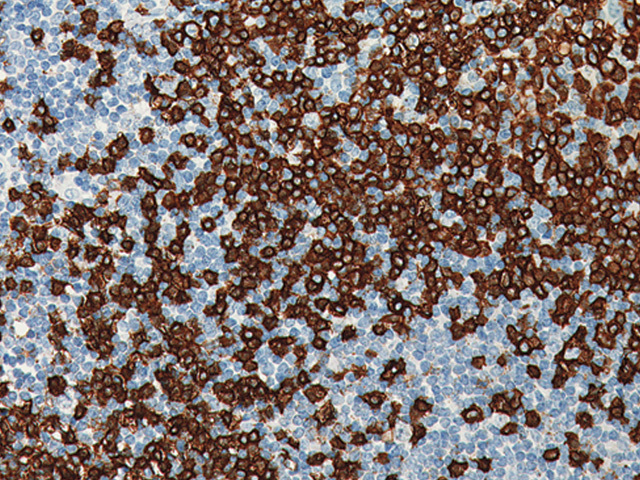 Studies have shown accurate categorization of ductal vs. lobular neoplasia in the breast with a cocktail of p120 + E-cadherin and helped give further clarification in the separation of low-grade ductal carcinoma in situ from lobular neoplasia. 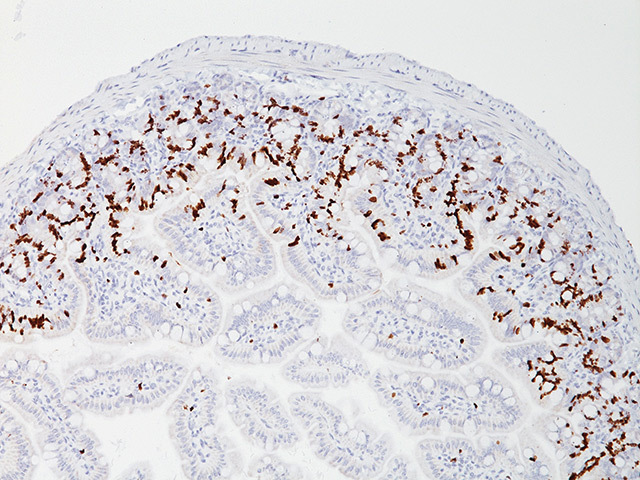 Of other tumors that may morphologically mimic lobular carcinoma, diffusely infiltrating variants of rectal and gastric carcinomas have shown diffuse cytoplasmic p120 immunostaining (1-2). 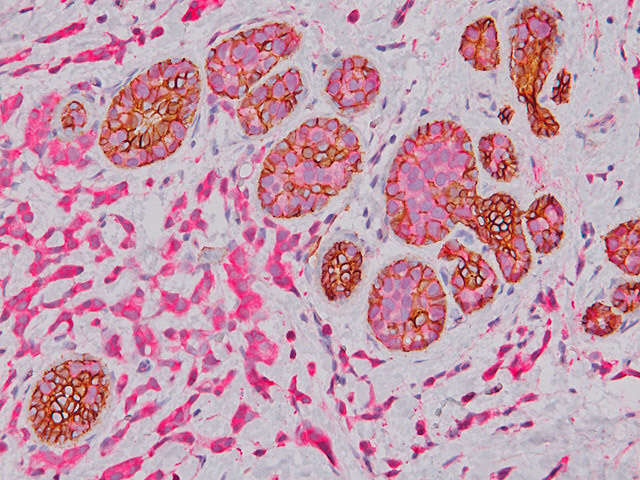 In conclusion, this Multiplex IHC stain may enable the identification of the presence and the extent of the lobular lesions due to its bright pink color in lobular lesions, and therefore may aid in providing a more accurate diagnosis. 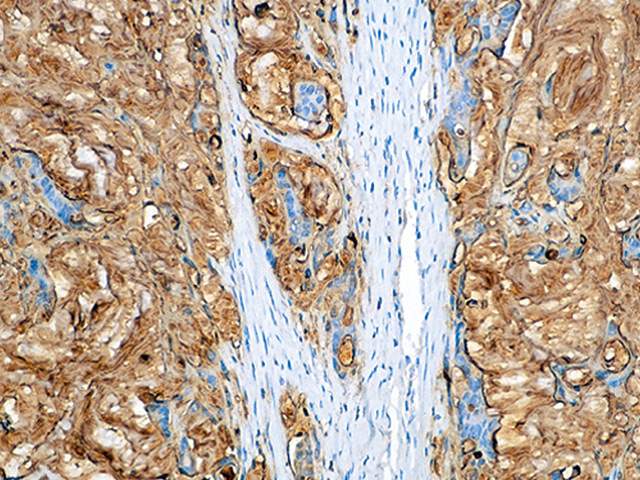 immunohistochemical and clinicopathologic study. Mod Pathol. 2007 Jan; 20(1):130-8.
diagnostic utility of p120 catenin. Am J Surg Pathol. 2007 Mar; 31(3):427-37.
mesenchymal transition of colon carcinoma is prognostic for aggressive disease. Cancer Res. 2005 Dec 1; 65(23):10938-45. Edition CLSI document M29-A4 Wayne, PA 2014.